There’s a wonderful scene in the award-winning movie The King’s Speech in which Geoffrey Rush’s character, in an effort to treat the future monarch’s stutter, points out to him that his impediment disappears the moment he starts singing. This wasn’t just a pleasant piece of celluloid fiction, but a very common, well-documented effect in clinical speech therapy. Researchers often speak of how the act of singing engages a neural “back door” to communication, thus avoiding the mental obstacles on the more conventional speech pathway that cause a stammer. The use of music to influence the emotional, mental and physical health of an individual goes back to at least the ancient Greeks, easily predating Congreve’s famous but oft-misquoted line about music’s charms in relation to the soothing of savage breasts. And if music can thus influence one person, why could it not transform a community as well? That’s the simple underlying premise of el Sistema: that society, a large, complex, and ultimately indefinable organism, can be healed or helped through music. And although Sistema and music therapy are not entirely analogous, there’s a very natural, organic overlap between the two. We see this common ground in the vocabulary Sistema-inspired programs use to describe their activities and their impact, and how it often emphasizes the development of the individual as much as the community. As paradoxical as it sounds, social change has to start by changing the attitudes and perceptions of the person first. 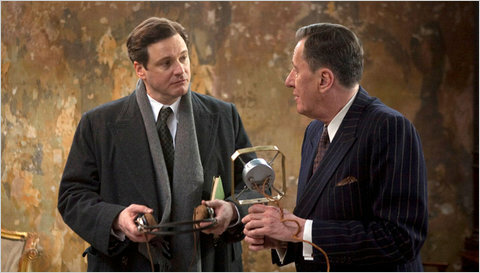 Firth and Rush in "The King's Speech"
I didn’t know anything about music therapy when I was asked to write the article published in the current print edition of the Canadian Association of Music Therapists magazine Ensemble (not to be confused with the more recent e-flyer of American Sistema programs), which CAMT has very graciously allowed me to make available online in full for the broadest possible access. Having done some research before writing the piece, I now know little more than nothing, but enough to have a deep respect for the profession and to see the intrinsic connection between what music therapists do for the person and what Sistema does for society. I also see a very fertile ground for discussion and collaboration within and far beyond the sphere of special needs students. There are mutual lessons for Sistema practitioners and music therapists, just as there are for Sistema practitioners and educators, social policy makers, symphony orchestras, child development specialists and psychologists. The idea behind the article was to introduce two sides of the same coin – no, two facets of the same jewel to each other, and I’ve been very gratified by the reception of the piece particularly by those not involved with either music therapy or el Sistema – it appears in bridging to each other I also bridged to those outside both communities as well, while penning the first article on special needs music education in Venezuela. This was probably good luck more than good management; as I’m fond of saying, even a snoutless pig can find the occasional truffle. Although never was an analogy more apt in my case, it might be more applicable to state that this article might serve as a “back door” to both fields and the very rich and thought-provoking ideas they have to share. Then again, while I understand the rationale for the term “back door,” I must confess I don’t care much for it. In King George VI’s pre-WWII society, the “back door” was the servants’ entry, the portal for entities of a lower order. It’s no republican sentiment that the King should be compelled to sing to make himself understood – rather, one might say it’s the natural order of things.